Old Town Academy (OTA) is a K-8 charter school focused on Core Knowledge, Project-Based Learning and Digital Literacy. Rooted In Place worked with the OTA Kindergarten class to develop a new kinder yard outdoor play and learning environment. Vibrancy, delineation of space and the need for variety of play and learning settings drove the design. Old Town Academy is a K-8 charter school focused on Core Knowledge, Project-based Learning and Digital Literacy. Rooted In Place collaborated with the OTA Kindergarten class to transform the outdoor schoolyard into a vibrant and dynamic play and learning environment. Rooted In Place facilitated a site safari with 25 kindergarteners to encourage them to observe their schoolyard through their sense of smell, touch, sight, and hearing, which informed their ideas for enhancing the schoolyard. Inspired by the students ideas, Rooted In Place developed a concept plan that used color and texture to help delineate the yard into various play spaces. 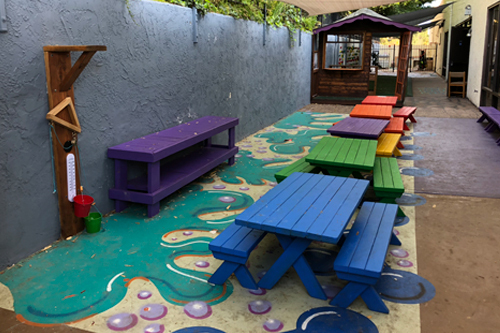 Rooted In Place led a community build day with 25 kindergarteners to help paint picnic tables and benches that serve both as a place to eat and as an outdoor learning lab. Parents showed their support by volunteering their time to build and install some of the larger structures, such as the climbing walls and storage shed. Role: Project and Construction Management, Community Facilitator, and Designer.